Yesterday we got the press release below from the people behind the Guinness Book of World Records: Gamer’s Edition. I, personally, love when someone assembles a list like this. It is a great way to get people talking, often loudly and irately, about who their favorite characters are and what makes a character great. Analyzing the list, though, one thing strikes me. Gamers, it seems, have got a long memory. We’ll start with the obligatory critique. Not all of the characters on this list are good video game characters. Naruto for instance. He’s an excellent character, certainly, but he’s an excellent character that is in a video game, not an excellent video game character. If Naruto is a video game character then John Madden is a video game character. Then there are other characters on the list that are characters in an excellent video game, but not excellent video game characters. Marcus Fenix, while the main character if a really fun game, is essentially a wall of meat with a cool gun, and the same voice actor as Bender… On second thought, I think that’s sufficient. Overall, list is a pretty good representation of the greats of the gaming world, though there are those on our staff, myself included, who feel that Nintendo’s characters probably should have dominated the top ten a smidge more than they did. (Samus is number 14? Seriously?) In the end, though, the list was created via a massive poll, not any quantifiable score of quality. As such, it is by definition a popularity contest. Knowing that, we are truly glad to see the range of eras represented here. The top three span twenty years, just by themselves. Well, Larry may have fallen in with a bad crowd, but this list proves that, if a character is good enough, he will stand the test of time regardless. Congratulations to all of the honorees. You can read the full release below, and feel free to let us know how you feel in the comments. NEW YORK (February 16, 2011) – Mario bounced over Solid Snake, Pac-Man chewed up Kratos and Lara Croft barreled through Donkey Kong as Guinness World Records® 2011 Gamer’s Edition revealed the Top 50 Video Game Characters of All Time. Voted on by more than 13,000 fans on the Guinness World Records Gamer’s Edition website (http://gamers.guinnessworldrecords.com/), the list includes heroes and villains from more than 30 years of video game history. Nintendo ruled the line-up with an impressive 11 characters included, followed by Sony and Capcom with six and five respectively. Additionally, 1996 had a noteworthy five timeless characters, followed by 1987, 2001, and 2007 with four each. While the Top 3 characters — Mario, Link and Master Chief — will come as no surprise, several omissions are sure to cause a stir. Mario’s lanky brother Luigi, Mortal Kombat’s spear-tossing legend Scorpion, Bio-Shock’s terrifying Big Daddies, and the adorable lemmings from Lemmings, all failed to make the cut. However, video game legends like Sonic, Gordon Freeman, Cloud Strife, and PAC-Man cracked the Top 10 thanks to their celebrated titles and pop culture significance. To see how people stack up against these iconic characters, Guinness World Records has launched a “Which Character Are You?” Facebook app (http://www.facebook.com/GuinnessWorldRecords). The new app will ask visitors to answer ten unique gaming questions such as “What Would Be Your Ultimate Power Up?” to determine a distinct digital doppelganger. Additionally, the Guinness World Records 2011 Gamer’s Edition eBook is now available for $12.99 and features hundreds of new video game records, facts, trivia, a classic quotes quiz and much more! Please find the full list below. Information includes the publisher with the game and year of the character’s first appearance. Guinness World Records is the universally recognized authority on record-breaking achievement. First published in 1955, the annual Guinness World Records book is published in more than 100 countries and 25 languages and is one of the highest-selling books under copyright of all time with more than 3 million copies sold annually across the globe. 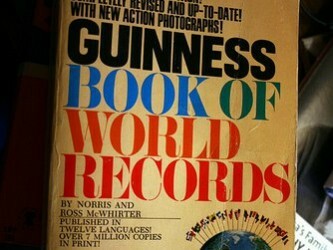 Guinness World Records celebrated its 50th anniversary edition in 2004, a year after the sale of its 100 millionth copy. Guinness World Records also annually publishes the Gamer’s Edition; a records book devoted solely to the world of computer gaming and high score record achievements.